The exit polls of the five state elections, considered the semi-final to the 2019 general election, throws up a Congress victory in 2 states. Here are the updates. 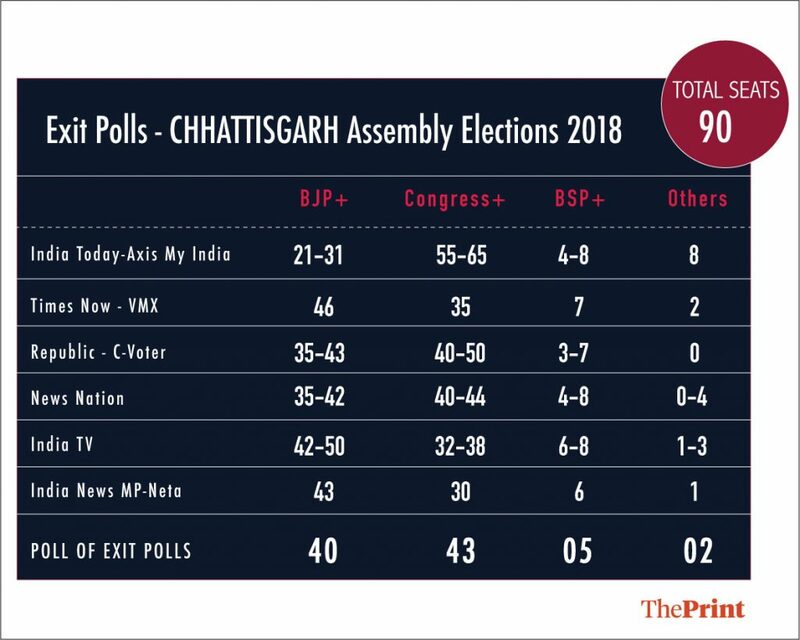 New Delhi: Poll of exit polls predict a Congress victory in Chhattisgarh and Rajasthan, but give BJP a win in Madhya Pradesh. Telanagana Rashtra Samithi hold steady in Telangana, while the Mizo National Front pulls ahead of the Congress in Mizoram. We bring you updates on the exit polls, with reporting by D.K. Singh, Ruhi Tewari, Neelam Pandey, Rohini Swamy and Pragya Kaushika. 9:25pm: This brings us to the end of today’s live updates on the exit polls. ThePrint will be back on December 11 when the votes are counted and the final results are declared by the Election Commission. 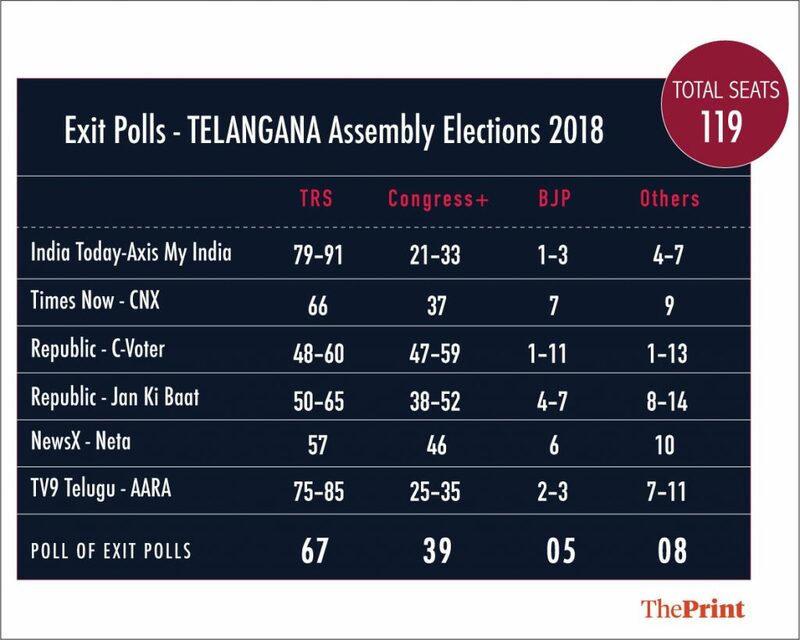 9:15pm: What the final Telangana exit polls predict. 8:20pm: In Chhattisgarh, Congress is predicted to win by a slim 2-seat margin. The elections in the state were about the performance and image of chief minister Raman Singh, and not Modi. 7:45pm: The Congress is predicted to win Rajasthan with 112 seats, while BJP is expected to bag 78 seats. 7:34pm: The final numbers are streaming in with BJP set for victory only in Madhya Pradesh. 7:20pm: In Mizoram, Republic TV-Jan ki Baat predicted a MNF win with 16-18 votes, and 14-18 seats for Congress. 7:10pm: Andhra CM Naidu has a lot of stake in the Telangana election as it would decide his political future in the state. If his TDP performs considerably well, he will be able to face his people in Andhra Pradesh with a solid performance. AP goes to vote in 2019. 7:05pm: The crucial game in Telangana is caste versus welfare schemes. The Prajakutami or the People’s Alliance led by the Congress hoped that their scathing attacks on the corruption and autocratic rule of KCR and his family would hit the right chord amongst voters. Andhra CM Chandrababu Naidu’s Telugu Desam Party is an ally in the Prajakutami alliance and has made it his one point agenda to weaken the TRS. 7:02pm: In Telangana, incumbent CM K Chandrasekhar Rao looks set to retain power. The ruling TRS has been banking on its farmer-centric scheme Rythu Bandhu, women-centric schemes such as Shaadi Mubarak and pension schemes like Aasara which have been implemented in the last four and half years. 6:57pm: The state polls are a referendum on the incumbent CMs. In Madhya Pradesh it was Shivraj Singh Chouhan versus Congress and in Rajasthan it was a mandate on Vasundhara Raje. Similarly, it was Raman Singh that remained centric to polls. 6:54pm: The exit polls suggest a failure of the Congress party’s strategy to play soft Hindutva in Chhattisgarh and Madhya Pradesh. Rahul Gandhi’s temple-hopping and attempts to please the majority community in it’s manifestos obviously failed if these polls are any indication. Gandhi will have to go back to the drawing board to re-assess the his party’s focus on Hindutva and pro-farmer-but-anti-industry pitch. 6:51pm: Republic TV-Jan ki Baat gives BJP a lead with 40-48 seats and Congress 37-43 seats. 6:46pm: If exit poll predictions about Chhattisgarh elections are proved correct on December 11, Raman Singh will emerge as the most successful BJP chief minister, having won four consecutive elections in 2003, 2008, 2013 and 2018. 6:40pm: If the exit polls’ suggestion of a close contest in Madhya Pradesh is true, the Congress has clearly failed to convert the pervasive sentiment for ‘badlaav’ (change) into votes for itself in a decisive manner. Given the extent of fatigue with the current BJP regime, the Congress should have succeeded in making this election all about itself. 6:39pm: A local Telugu news channel TV9 predicts 50-65 seats for ruling TRS, about 38-52 seats to Congress, 4-5 seats for BJP, and about 8-14 seats to others. 6:37pm: Telangana saw extensive campaigning by the ruling TRS on the basis of their welfare schemes. Incumbent chief minister K Chandrashekhar Rao hopes to pocket more seats that their previous performance of 66 in 2014 . Telangana is the youngest state in the country to go to elections. 6:33pm: Polling in Telangana and Rajasthan ends, announces Election Commission of India. 6:25pm: Rajasthan was considered the only state where BJP was sure of losing. The last leg of campaign had PM Modi create some buzz in the BJP camp, but it wasn’t enough. From a party that is contesting to lose to a point where it is considered to ‘have come back in fight’, BJP did put up a united front. 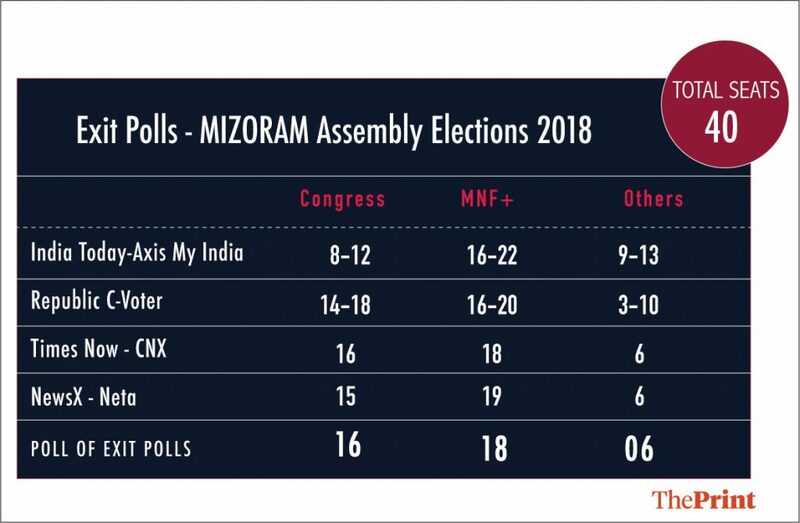 6:20pm: In Mizoram, poll of polls predict Congress is set to win 18 seats. The Mizo National Front (MNF) is emerging as the single largest party, whereas the BJP is yet to even open its account. 6:18pm: In Rajasthan, Times Now-CNX predicts a Congress victory with 105 of 200 seats, followed by BJP wih 85. The BSP could win 2 while others will take 7 seats. 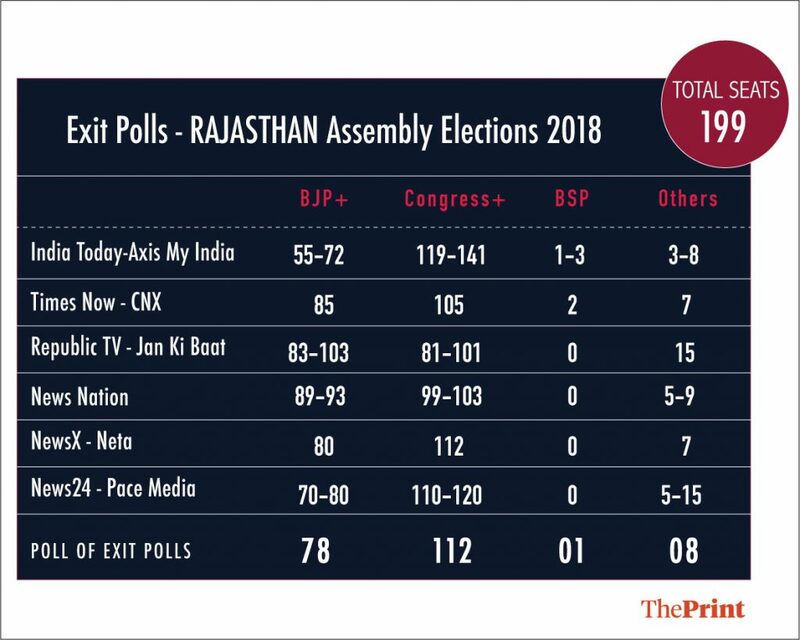 6:15pm: India Today is giving Congress a clear majority with 119-141 seats, and the BJP 55-72 of the 200 seats in Rajasthan. 6:10pm: Times now-CNX gives the TRS 66 of 119 seats. The ruling party hopes to score a century this election. Others, which include Asaduddin Owaisi’s AIMIM, will get 9 seats. 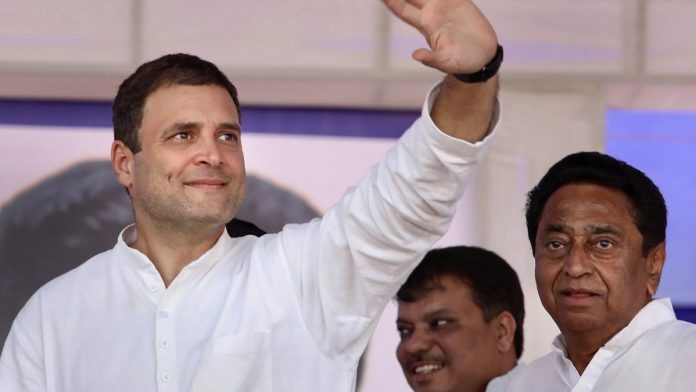 6:05pm: The Madhya Pradesh poll has been a close contest, with both Congress and BJP as well as voters terming it as a ‘takkar ka chunaav‘. Exit polls so far seem to echo the same sentiment. Will the anti-incumbency against chief minister Shivraj Singh Chouhan’s government be enough to topple this three-term regime? Can Mayawati’s BSP dent the Congress in regions where it is strong? 5:56pm: Poll of polls put BJP ahead in Chhattisgarh with 46 of 90 seats, followed by Congress with 35. The halfway mark is 45. 5:50pm: Times now-CNX predicts a clear majority for the Telangana Rashta Samithi (TRS) in Telangana with 66 seats whereas the exit poll gives 37 seats to Congress. The BJP is predicted to win 7 seats. 5:47pm: Poll of polls on Madhya Pradesh predict a BJP victory with 115 seats, followed by Congress with 105. 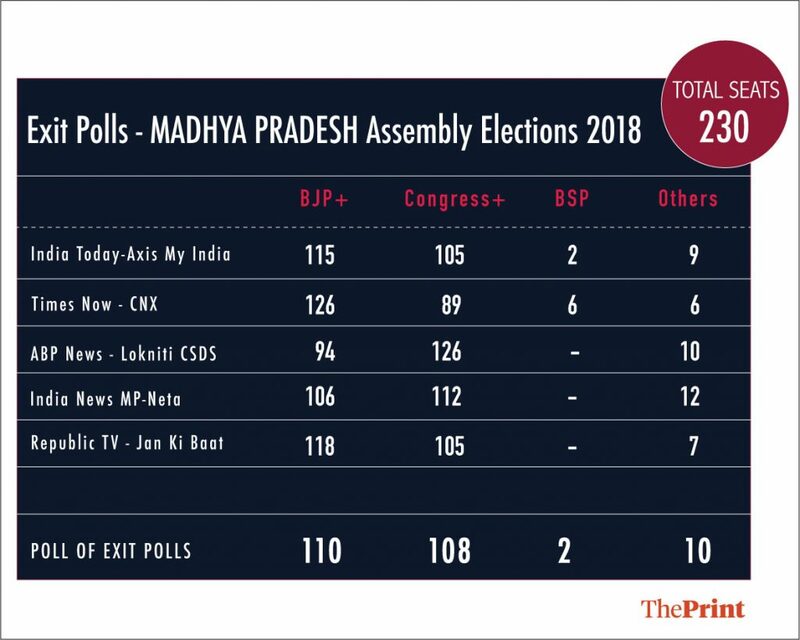 5:45pm: India Today-Axis My India predicts 102 seats for BJP and 104 for Congress in Madhya Pradesh. 5:41pm: Exit poll trends begin streaming in. Times Now-CNX exit polls predict BJP victory in Madhya Pradesh elections with 126 of the 200 seats. Congress is predicted to win 89. 5:30pm: Polling ongoing in Rajasthan and Telangana.